The Grand Army of the Republic Booth Post #130 was formed by sixteen Union Army Veterans of the Civil War. The GAR Hall was constructed in 1891 to be used as a meeting hall for the fraternal organization and the Woman’s Relief Corps, who later held the deed when the veterans’ numbers dwindled. The GAR Hall was opened up after a long sleep by the Grand Meadow Girl Scout troop who became curious about the building and its use. With the assistance of the Mower County Historical Society, the scouts set to work taking an inventory of the building’s contents and prepared it for the public. Eagle Scouts have also given their devoted attention to the hall by painting and making repairs to the building. The Hall houses Civil War memorabilia from the Booth Post #130 banner to portraits of soldiers, paintings done by the daughter of GAR member C.F. Greening, and other Grand Meadow area artifacts. 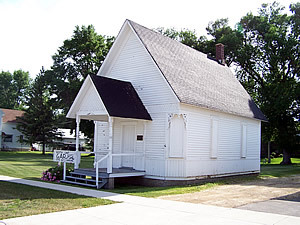 Placed on the National Registry of Historic Places on June 13, 1986, the GAR Hall is one of the last two remaining halls in Minnesota. The GAR Hall is truly a national treasure to honor those who have fought in the past and continue to fight for our nation’s freedom. To arrange a tour of the GAR Hall, please contact the Mower County Historical Society at (507) 437-6082.